To every teacher everywhere...I can no other answer make, but, thanks, and thanks. ~William Shakespeare Next week is teacher appreciation week. It is an opportunity we can all take to thank the teachers of our little angels. My kids all have fantastic teachers this year and for that I'm grateful. Take a few minutes to give a gift or pen a note to let your kid's teachers how their hard work is appreciated. We are still trying to decide what special gift we'd like to give this year but these are gifts we've given in the past. For this cute flower arrangement you need 4 doz pencils, two rubber bands, an empty can or crystal light container and some bright yellow or orange flowers. Place the rubber bands on the container and space the pencils around. Fill in with pencils all around the container. Pack them pretty tight. Fill container with water and flowers. A perfect gift that keeps on giving. What teacher can't use a few dozen pencils? With this one we went with a patriotic theme. We bought lots of treats that were red, white and blue. Attached them to wooden skewers with tape and stuck them into a container filled with Styrofoam. We added crinkled paper to cover the Styrofoam. 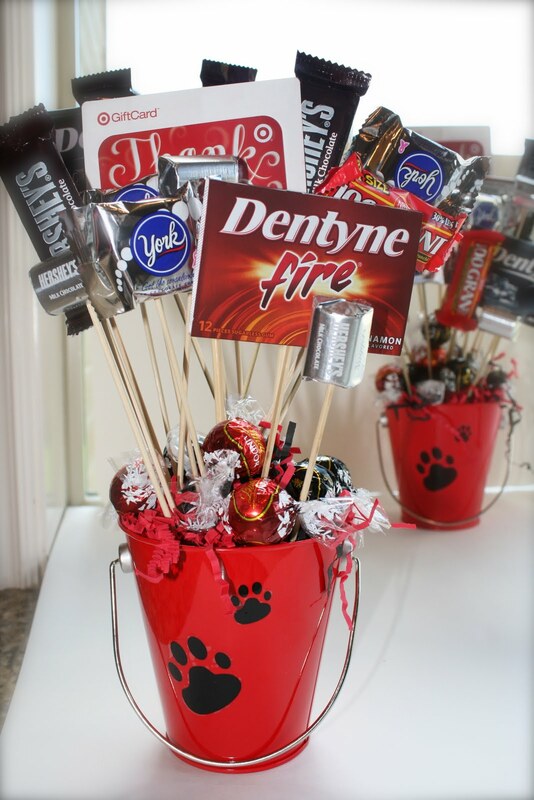 This is a little of the same but we added paw prints and bought candy in the school colors. We also added a Target gift card for the teacher to use on supplies, etc. I realize this isn't a teacher's gift but this idea could be used for one. Grab some candy in the candy aisle of your grocery store and make a cute saying...who doesn't like candy? Be creative and have fun! There are other great ideas for teachers gifts here. 1 Response to "Teacher Appreciation Week"
Thanks for doing all of my thinking for me. Great ideas!